Skogaryd Research Catchment comprises a landscape concept with an entire watershed system where the interaction between terrestrial (soil and land) and limnological (freshwater) ecosystems can be studied, along with their interaction with the atmosphere. 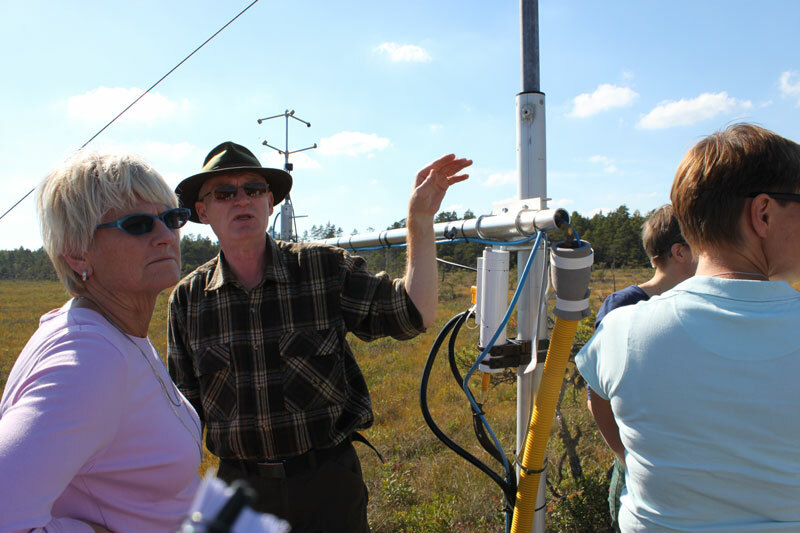 The station was included in the Swedish Research Council’s infrastructure network SITES (Swedish Infrastructure for Ecosystem Science) in 2013. The network is supported with SEK 25 million annually. In 2005, a major storm that swept through Sweden destroyed Leif Klemedtsson’s research facility. About eight years later, the new facility he has been part of building has become part of a national infrastructure network. ‘It puts us on the map both nationally and internationally, and in the long term it enables us to conduct high-quality ecosystem research,’ says Klemedtsson. Klemedtsson, climate researcher at the Department of Earth Sciences, has been involved in the construction of the research facility in Skogaryd since 2006. Looking for a new area with the right conditions, somebody told him about Skogaryd, a forested area between the municipalities of Uddevalla and Vänersborg. It took five years to build the station, and earlier this year the Swedish Research Council decided to include it in a national infrastructure network of research stations for field research on terrestrial (soil and land) and limnological (freshwater) ecosystems. ‘We’re using a landscape concept to study the interaction between the atmosphere, mires, two first-generation forests standing on former drained arable land, lakes and streams – a so-called ”Earth System” station,’ says Klemedtsson. Studies of the interaction between different ecosystems have been relatively uncommon in the past, as research has usually focused on only one ecosystem. When the entire landscape is included in the research, it provides a much more complex understanding of all the emissions that occur. ‘The station in Skogaryd is unique since it connects the terrestrial and limnological systems – we can study the exchanges both between the different systems and between the systems and the atmosphere,’ says Klemedtsson. A special feature of the station is lake Följesjön. The lake receives a great deal of the organic material that is transported from the forests via streams. Once in the lake, the material decomposes into for example carbon dioxide and methane, which has turned the lake into a so-called hot spot for methane emissions – a normal forest lake in the same climate zone as Skogaryd releases 0.2-1 mmol methane per square metre and day, whereas Följesjön during certain periods emits 4-9 mmole. Consequently, the total effect can be that the area releases more greenhouse gases than it absorbs. Leif Klemedtsson showing Skogaryd to Pam Fredman, Vice-Chancellor of the University of Gothenburg. Klemedtsson says that becoming part of a national infrastructure has been important in many ways. It means that the station can be equipped with good logistics and equipment, it improves the opportunities for high-quality research and education within for example biology and environment science, and it makes the research at the station more visible. It also adds a long-term dimension since it enables researchers to design field experiments with a duration of 20-30 years. The vision for the station is to make it a national centre for international collaborations. ‘It’s an open station that actively facilitates knowledge exchange with other researchers. In the long term, this will help us attract more research funding and design better research projects. We are an internationally acknowledged infrastructure with highly ranked research activities and hope that being part of the network will enable us to attract more researchers to the station.